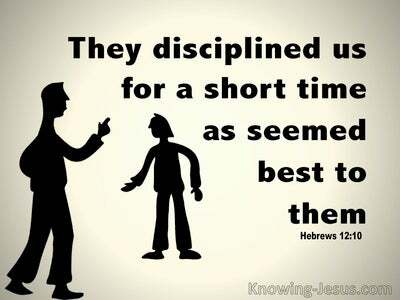 What Does Joel 2:28 Mean? The book of Joel was written to the Jews in exile, and likened some of the past terrors they experienced in their dispersion, to a plague of locusts. Much of his prophecy was future, and looks ahead to the coming 'Day of the Lord', when the devastating effects of the many plagues of locusts Joel described, would be reversed.. and the years which the locusts had eaten would be fully restored to Israel. Like all of the prophets of old Joel gave the command for Israel to repent. He called for a sacred assembly, where the whole nation would humbly cry out to the Lord for grace and mercy - so that their outward submissive actions would reflect an inward repentant heart. 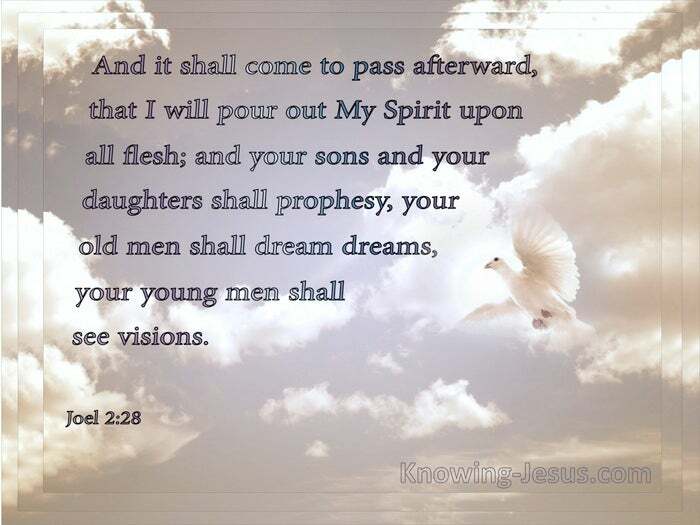 And the promise that Israel received through Joel was that: afterward, that I will pour out My spirit upon all flesh; and your sons and your daughters shall prophesy. Your old men shall dream dreams and your young men shall see visions. But that time is still future for the lost sheep of the nation of Israel, who have yet to accept Christ as their Messiah and King. The physical deliverance and spiritual renewal for Israel that is found in the little book of Joel, and the wonderful promises that God made to His people will come into full effect at the end of the tribulation - that future time of Jacob's trouble. For in that day God will truly pour out His spirit on all flesh... and they will exercise many prophetic gifts and God will replace their hardened hearts of stone, with softened hearts of flesh. It is at the end of the tribulation, when Israel as a nation will cry out in faith: blessed is He Who comes in the name of the Lord, and it is at that time that this amazing prophecy of Joel will be fully and finally fulfilled - but there are certain signs that need to be carried out before that great and terrible day of the Lord. 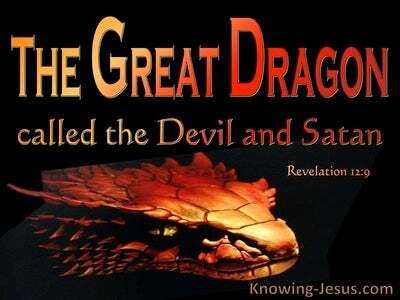 We are told that the time of Jacob's trouble will be preceded by blood and fire and pillars of smoke - the sun will be turned to darkness and the moon into blood before that great and terrible day of the Lord - when God will pour out His wrath on a Christ-rejecting sinful world. 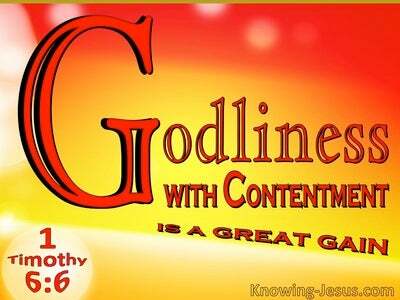 We are also told that the Gentile will receive God's fierce judgement in that day, when He gathers all nations to the Valley of Jehoshaphat. The day of Pentecost, when the Church was born, was a partial fulfilment of this amazing prophecy. Pentecost was a tiny foretaste of what is yet in store for the nation of Israel, when they shall look upon Him Whom they have pierced and accept Christ as Saviour and Lord. At that time He will return to the earth with great power and glory, to set up His millennial kingdom and rule the nations with a rod of iron. 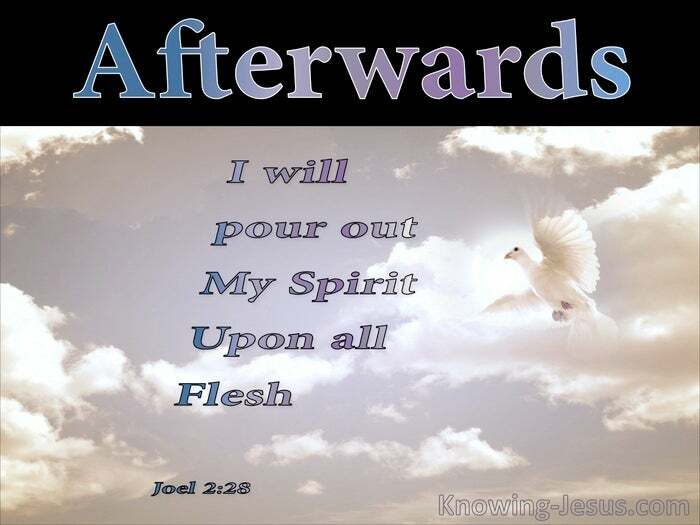 In that day it shall come to pass that God will pour out His spirit upon all flesh. Sons and daughters shall prophesy. Old men shall dream dreams and young men shall see visions. In that day the Lord will set up His King firmly on His holy hill of Zion and He will sit on the throne of His father David. In that day the wolf will be living with the lamb, and the leopard will take his rest with the young goat. In that day the lion will eat grass like the ox; and the young lion will lie down with a little lamb - and a young child will be their guide. In that day cows and bears will feed together - their young ones shall lie down with each other; and the lion shall eat straw like the ox. Heavenly Father, thank You for Your many precious promises to Your people Israel and that despite their rejection of Christ as Messiah You have not rejected them. Thank You that in Your grace You gave Your Spirit at Pentecost to dwell in the heart of all who trust Christ as Saviour and thank You that this wonderful prophecy will one day be finally and fully fulfilled. 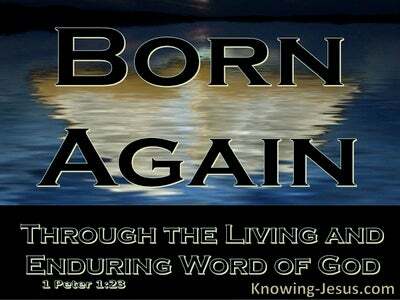 But until that time.. use me I pray to tell out the good news of Christ - in Whose name, AMEN.